I can hear the questions in your head. A Richmond flag? At VFL Park? Something’s not quite right. In fact the year I’m focusing on is 1989, when my beloved Tigers won the wooden spoon, barely seeing out the following year, 1990, due to hemorrhaging finances. But there was a ray of sunshine, a light at the end of the tunnel. 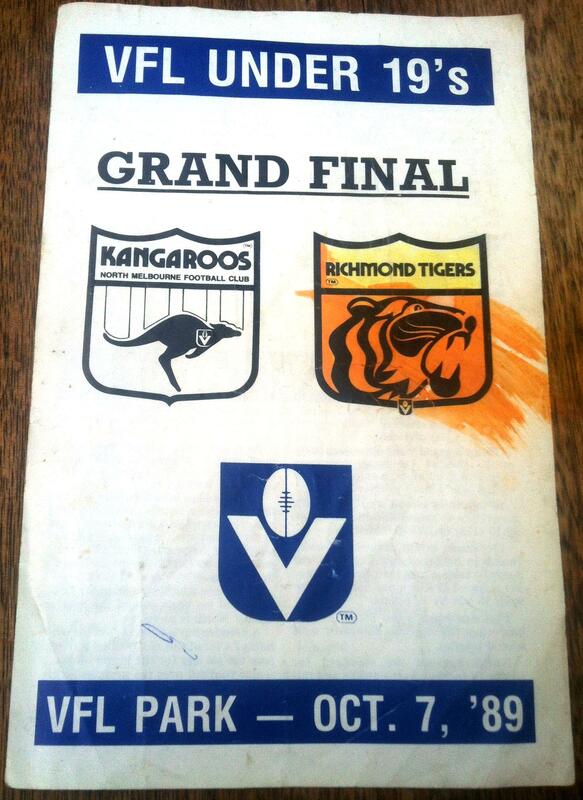 The 1980’s are bookmarked with Richmond premierships. Yes that’s right, we won the under 19’s flag! The game was meant to be played as the first of three matches on arguably the most famous grand final day of them all, when Ablett thrilled us with his wizardry, Brereton with his courage and the Hawks with their tenacity to make it back-to-back flags. However the Richmond under 19’s played a draw in the finals series which back then meant coming back the following weekend to resolve differences, meaning that on grand final day, the curtain raiser to the main event was in fact the under 19’s preliminary final. And so it was that 10,000 fans headed out to Waverley Park the following weekend, of which around 9,500 wore yellow and black. I was there with my family, and as an added extra my nana and pa were there too, the only game I ever went to with them. As I have mentioned before in these pages, they were a huge influence on my love of Richmond. 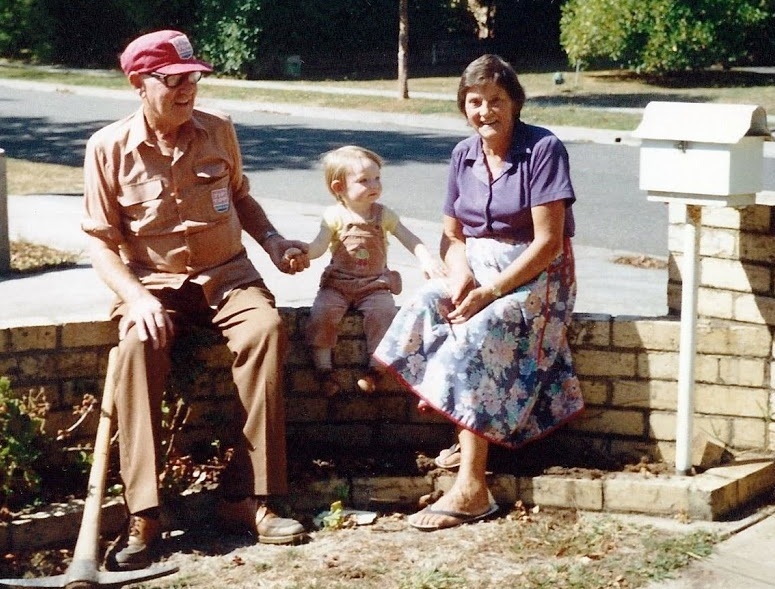 Here’s a shot of yours truly with my nana and pa in their Forest Hill home, pa with his Tip Top work gear on. I also look back on the day fondly because, unwittingly, it would be my first sighting of Stuey Maxfield, a favourite of mine, in a Tiger guernsey. He wore number 9 that day and was one of a handful to go on to wear the yellow and black in the seniors. Ash Prescott, Matt Francis and Ty Esler the other notables. A look through North’s under 19’s list is also interesting, in particular Brad Sholl and Anthony Stevens, whilst Glenn Kilpatrick would also carve out a nice little career down at Geelong. Oh, and the North coach of the day turned out to be pretty handy also! 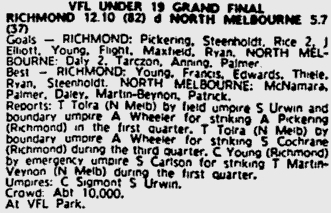 Given North had won the two previous under 19 grand finals, this result was all the more pleasing. What a great institution the under 19’s was. North used it to perfection, with many of their 1996 and 1999 premiership team having come up through the junior ranks. It’s now just a distant memory. Not one passage of play remains with me from that day, but I can chalk it down as having seen a Richmond premiership, in the flesh. The only memories I have are that we entered via the members wing which we’d never done before, that we walked into the ground alongside Mil Hanna, where we sat (members wing-ooh ahh!) 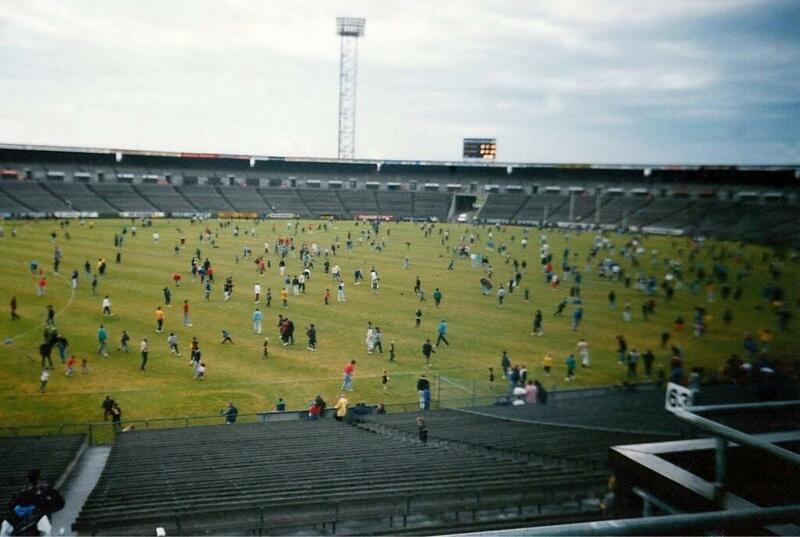 and a kick on the ground after the match. I also remember sitting in nana and pa’s old falcon post match on our way back to their house for dinner. Tiger fans celebrated that day like no other club would celebrate an under 19’s grand final win. Though our last flag was only 9 years prior to this, the club was really down and out, a shell of our ruthless self. Little did we know that we’d still be waiting for a senior flag some 24 year later! Cory Young of Richmond was named as Richmond’s best on ground. Tiger fans foamed at the mouth about Cory Young, much like the way Justin Plapp became a cult hero down at Punt Road in the reserves. 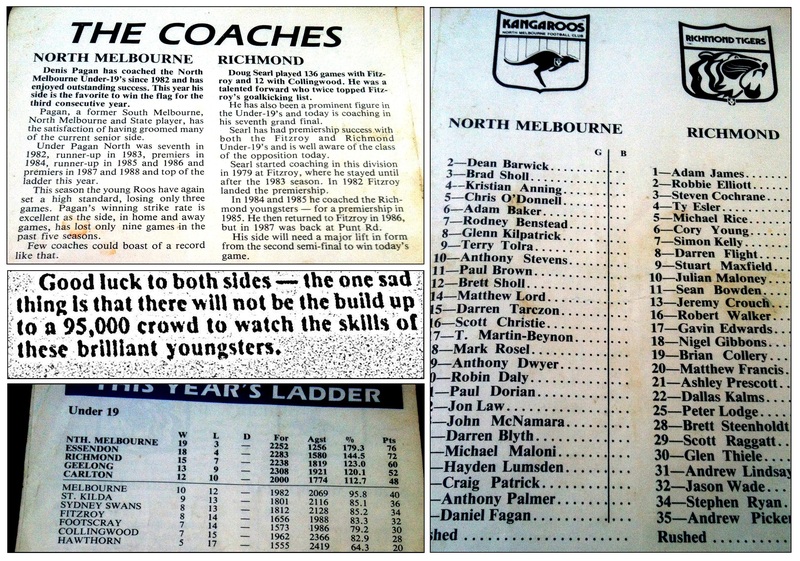 Having played seniors in the final 3 rounds of 1989, Young came back to the under 19’s for the finals, helping the Tiges lift the premiership cup on the first Saturday in October. Alas, Young never kicked on, playing just 4 more league games, three at Tigerland and one for West Coast. He did however win a Liston Trophy in the VFA with the old Oakleigh footy club, so the kid could play. 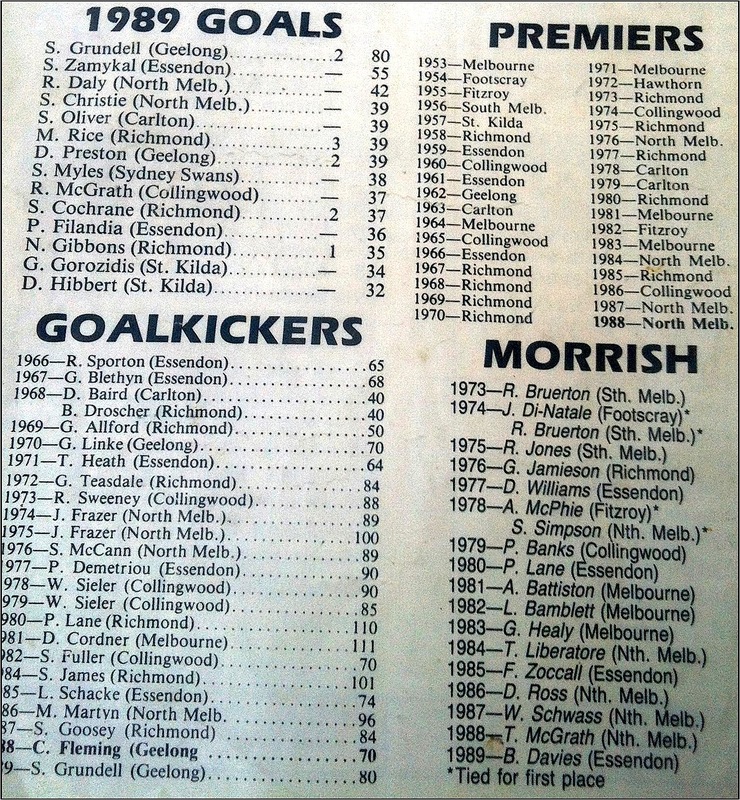 These lists make for some interesting reading, Peter Filandia the most notable player in the goal-kicking list! I’m still waiting to see another Tiger flag, a reserves win over Hawthorn in 1997 all that now keeps me going. But back to that glorious day of which I have little to no memory, and what better way to conclude a day at the footy than with a kick on the spacious playing surface of VFL Park. NOTE-This was the last official match under the Victorian Football League (VFL) banner, the league changing to the Australian Football League (AFL) the following year. This does not include any exhibition matches which may have been played at the Oval in London! And thanks to @Crankie82 on twitter for help on the final score, and @footyjumpers for finding the grab from the Age. VFL Park photos taken by my mum. This entry was posted in Nice Statistic and tagged 1989, afl, Corey Young, Denis Pagan, Footy, Grand Final, Liston Trophy, nana and pa, North Melbourne, Oakleigh Football Club, record, Richmond, Stuart Maxfield, Tip Top, VFL, VFL Park, Waverley park by theholyboot. Bookmark the permalink. What a memory, especially being there with nana and pa. So glad we got to do it once as a 3 generation family. Photos bring them back to us for a moment. They would be so proud of how you share your yellow and black blood! Thanks for another great post. Very, very enjoyable, Holy Boot. ‘Especially like the picture of your nana and pa, with an adze leaning against the brick fence. As for your Pa’s Tip Top uniform – the Wodonga Bulldogs ground has a small stand/shelter called The Tip Top Bakeries Stand. Another great post John. A tiger premiership and a sunny day at Waverly! North would have gone in hot favorites judging by their ladder position. Plus being coached by Pagan. Interesting looking at the premiers list, just how many u/19 flags the tigers did win. And there may be another one around the corner! I can boost my cred here – I was backpacking in Peru at the time! I was a 20yo on my first trip out of Australia, dodging Shining Path guerillas on the Inca Trail. I heard in Cuzco that Ablett had kicked 8 for a losing side in an incredible grand final. But no-one thought to mention the 19s! I never knew of this Tiger flag until now. Good one John, love your work.